As India increased in importance, the British sought to secure access to and from its most important colony. To start with, they considered the waterless inhospitalible island of Perim at the mouth of the Red Sea. This was originally occupied in 1798 when Napoleon landed an army in Egypt. However, it was clearly inadequate and soon the British had to look to the near-by mainland for a base. Their choice fell naturally on the superb anchorage at Aden, one of the finest harbours between London and Bombay, and perfect to serve as a coaling station for the East India Company's first Nineteenth Century steamships. Aden had once been known as the prosperous "eye of the Yemen," a natural port of call on the Red Sea route to the East and the outlet for the fertile Yemen mountains, 100 miles to the north. But after the Turks had conquered the interior in the Sixteenth Century and Europe's merchants had discovered the Cape route to India, Aden had declined into nothing more than a pirate village preying on Indian Ocean traffic. 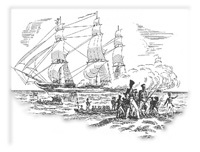 However, in the 1830s, Muhammad Ali in Egypt began challenging the Ottoman Sultan's power in the region and in 1833 went so far as to send an expedition to Mocha in the Yemen. The British, or rather British India, decided to allow Aden to at least remain open as a port to British ships as Muhammad Ali's rise in power in the region appeared to continue ominously. There was also the added consideration that the increasing use of steamships required regularly spaced coaling stations to allow them to refuel and continue their journeys. Therefore, in 1835 an agreement was made with the local Sultan to use Aden as a coaling station as it was midpoint between the Suez transit point and the Bombay Presidency in India. By 1837 the Bombay Governor Robert Grant felt that this informal arrangement required formalising: "I think that it will be absolutely necessary to have a possession of our own on or near the Red Sea.". The opportunity arouse when nearby locals were accused of maltreating the survivors of a shipwreck. The Sultan agreed to sell his share of the port to the Bombay government as restitution. However, the Sultan's son and other local chiefs objected when a Naval delegation arrived to finalise transferance. Therefore an expedition was despatched by the East India Company. In 1839 Captain Stafford Haines of the Indian Navy landed from Bombay with 700 men and a couple of Royal Naval sloops in support. At a cost of only 15 casualties he annexed Aden to the Bombay Presidency. It was the first imperial acquisition of Queen Victoria's reign and one destined to carry some flavour of the Victorian Age far into the 20th Century. It was soon to prove the strategic worth of its location when the main telegraph wires linking Britain to India came ashore in Aden in 1859. This was some 5 years before the main telegraph line linking Britain to India was functioning fully. Haines, who was appointed political agent in the territory, had a vision of restoring Aden to its former commercial glory. And after the Red Sea route to Europe was reopened in 1869, with the inauguration of the Suez Canal, Aden's trade did indeed increase. Indian merchants moved in to exploit the new commerce. Indian clerks manned the offices of the new shipping agents, and behind the headland known as 'Steamer Point', where the P. & O. vessels took on coal, a whole new Anglo-Indian town arose, full of the characteristic wooden bungalows and box-wallahs of the Raj. But to the Indian officials Aden was primarily a military outpost. They therefore rejected the possibilities of commercial co-operation with the Yemen and chose instead to strengthen the defensive barriers between Aden and the interior by extending exclusive treaties of British protection to all the principal rulers of the South Arabian coast. Not all the sheikhs received the British overtures, and many lesser tribal rulers were ignored (a fact that was to cause troubie for the British in later years, when favours offered to the treaty sheikhs stirred the others to rebellion). But, one way or another, by the end of the century some 30 ill-defined tribal states between the Red Sea and the Sultan of Muscat's territory in Dhofar had been recognized by Britain, thus creating that curious strip of pink on the old schoolroom maps of Empire known as the Aden Protectorate. In Aden Britain's chief official was also a Resident appointed by the Viceroy. The Resident's staff was recruited from the Indian Army, or even the Indian Civil Service. Indian soldiers provided ceremonial guards at the commissioner's compound. Indian Army engineers built their characteristic administrative compounds, Indian merchants ran the trade, Indian rupees were the standard currency and Indian words and customs laid a veneer of Indian culture on both the Arab and Persian worlds. The Aden Troop was created in 1855 to police the territory which was technically only 80 square miles but had a vast hinterland of 9000 miles of desert and mountain known as the Aden Protectorate. Its chiefs were nominally under the control of a political resident who was also the military commander. The Aden troop was recruited from members of Scinde Horse and Poona Horse with an Arab Levy to act as guides. It later substituted its horses for camels and it was generally involved in patrolling against bandits. The troop was later used in Somaliland and existed until its disbandment in 1927. Aden also took on the administration of various islands that the admiralty wished to keep an eye on to help suppress piracy or to warn ships lest they run aground on their treacherous shorelines. Kamaran Island and Perim Island in the Red Sea were two such islands, and the Kuria Muria chain which was received as a gift from the Sultan of Muscat in 1854 were also transferred to Aden for administration in 1886. That same year also saw the nearby island of Socotra enter into a Protectorate agreement to be adminstered from Aden also. By the mid 1930s the modern map of Arabia was taking shape and a fitful sort of peace was falling upon some of its ancient tribal squabbles. In the Hadhramaut, a young political officer, Harold Ingrams, was able, only a year or two later, to settle 1,000 years of quarrels almost singlehandedly. In three years of lonely travel and tribal negotiation between 1936 and 1939, Ingrams obtained the signatures of over 1,300 local chieftains to a general truce that became known as "Ingrams' Peace." Increasingly preoccupied by the independence struggle at home, Indian officials no longer had the energy or the interest to spare for the Arabian outposts of their empire in 1937. The Colonial Office in London assumed responsibility for the Aden Protectorate and made Aden itself a fully-fledged Crown Colony, with the intention of pursuing a "forward policy" of colonial development and defence to safeguard Britain's interests. In 1940, it divided the Aden Protectorate into a Western Aden Protectorate (WAP) and an Eastern Aden Protectorate (EAP) for administrative purposes. However, the Second World War changed the strategic dynamics and plans for the colony. The German advance in North Africa and the Japanese advance in South-East Asia revealed Britain's strategic weaknesses across the Empire as a whole. The loss of Singapore and the requirement to pull back to defend Britain showed that it could no longer defend the entire empire. Furthermore, the post war Labour government stuck a dagger through the strategic rationale for Aden by giving India its independence in 1947. If that wasn't fatal enough, the Suez debacle a decade later seemed to make Aden even more redundant and yet almost by default it would go on to became Britain's largest overseas military base as oil became the new strategic commodity of choice. The naval units in the Gulf were strengthened, troops were trained in the Oman Desert, and the belated "forward policy" of the 1930s became an urgent drive for military security, economic development and political reform. But the British were running further than ever behind the clock and, paradoxically, the more they tried to catch up, the more they caused events to accelerate out of their control. Ostensibly established to defend the Gulf oil-fields, the post-Suez base in Aden had to devote most of its energies to protecting itself from unrest in the colony and tribal dissidence in the Protectorate, conditions inspired partly by the very existence of the base. By 1962 it seemed that only desperate measures could succeed; and in September of that year they were duly taken when the colonial government bulldozed through the Aden legislature a Bill to unite Colony and Protectorate in the mutually protective Federation of South Arabia. But once again the British were too late. The next day a group of military rebels in the Yemen overthrew the Imam's regime, proclaimed the birth of the Yemen Arab Republic, and begged for Egyptian help. Within weeks, tens of thousands of Egyptian troops had arrived and both the Yemen and South Arabia were plunged into a multi-sided civil war. 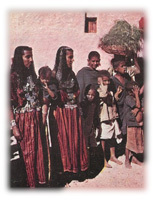 In the Yemen, the Egyptians and Republicans, 'with Russian and Chinese support, were locked in battle with tribal supporters of the old Imamate - who in turn were sustained by money and arms from the Saudis, proclaiming a holy war against Communism and Nasserism on the sacred soil of Arabia. By the end of 1967 it was all over. The British forces had suffered some 60 killed and 700 wounded in the hardest anti-terrorist campaigning since Malaya and the indignity of their final departure ranked with the retreat from Palestine. There were no friendly ceremonies of independence here, only bitterness and the taste of failure. 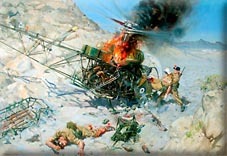 The last British High Commissioner had to be lifted out by helicopter under armed guard to a naval carrier standing well offshore, He left behind the first avowedly Marxist state to take the place of Empire, the (People's Democratic Republic of South Yemen) and a city racked by fear and poverty that had come to resemble a ghost town. "Gone Away - No Milk, No Papers," was the message left by a soldier on the wall of Aden's empty prison. It summed up Britain's abrupt departure after more than a century of continuous occupation and control. Silent film documenting the south-western coastline of Aden from the port of Mukalla to the region bordering Saudi Arabia. Michael Crouch recounts the antics of some of those political officers who over-imbibed despite living in an Islamic part of the world which looked down on the drinking of alcohol.